A little quiet on the blogging, eh? Lots of projects in the works right now - one of my recent favorites is the recent Evening at the Mansion for the St. Martin's Alumni Association last week. Had to wait until after the event to show the goods, as Finian Road Image & Design designed the invitation suite for the event. Included in the design - the map card, tickets, a cover piece with the latin inscription "Crescere Mutando, Mutare Crescendo" all ribboned together with black satin ribbon, inside black linen envelopes. 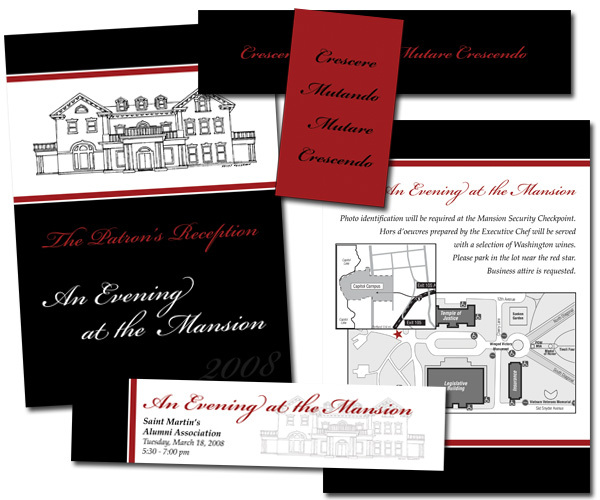 There was a custom line drawing of the Governor's Mansion that was provided, and incorporated into the design. The final pieces had rounded corners as well. The event was held at the Governor's Mansion in Olympia, to thank the donors for their support of St. Martin's. A fabulous evening coordinated by the Alumni Association. Lots of design projects delivered over the past few weeks - baby announcements, adoption announcements, and some custom work for a firm in Tacoma. There's a few more coming shortly - can't wait to highlight them on the newly designed Finian Road website - set for sometime in April!